Pham (shoulder) will serve as the Rays' designated hitter in Thursday's spring game against the Phillies, Marc Topkin of the Tampa Bay Times reports. Pham will play in his second straight game after he and the rest of his teammates had a team off day Wednesday. 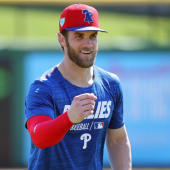 The fact he is serving as the designated hitter again indicates his shoulder is still not 100 percent, but it is encouraging he will play in back-to-back games for the first time in a week. Pham will hit third in the order in Thursday's contest.